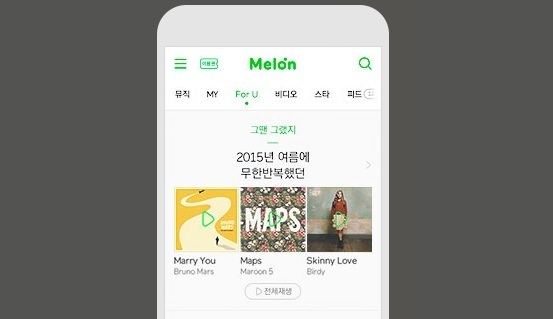 Melon, the music streaming app operated by South Korean mobile business giant Kakao, dominates the country’s music streaming service market, leaving little room for foreign players like Apple Music to join the competition, new analytics data released Tuesday showed. According to Seoul-based app analytics firm WiseApp, Melon was, by a large margin, the top-used music streaming service here in March this year. Melon saw 5.69 million users as of March 2018, up 7.6 percent from 5.29 million users in March 2017. In second place was Genie Music, operated by local carrier KT, with 2.06 million users in March. It marked a 7.56 percent increase on-year from 1.87 million users. Coming in third was Kakao Music, another Kakao-run music sharing platform that lets users stream, purchase and share songs with friends. It had 1.73 million users in March this year, up 10.16 percent from 1.33 million users in the previous year. Behind the top three music streaming services by number of users were Naver Music, Bugs and M-net, all of which are operated by Korean companies. YouTube Music, the music streaming app provided by Google’s video-sharing platform YouTube, came in seventh with 490,000 local users in March. The app’s user number saw a 6.52 percent growth from 460,000 users in March 2017. The data was compiled via a sample survey of 23,000 Android smartphone users in Korea to represent a population of 37.12 million users of music streaming services here, according to WiseApp.